Before we jump into the patch we would like to address that from now on patches will be "version" based. We will now start numbering patches in versions. 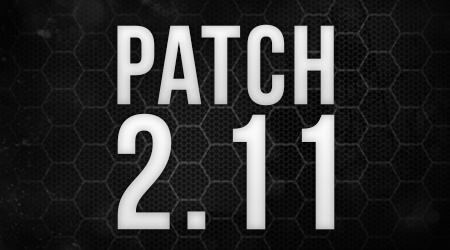 For this patch this will be "Patch 2.11". Just to make everything easier but also behind the scenes to structure more and keep everything organized. Updated the impact sounds for sharp melees. The "Melee impact" sound here was a bit too loud compared to the "Terrain Impact" sounds. Fixed a major issue related to character clothes. Players would sometimes not be able to use a certain character cloth that they bought. This is now fixed. Optimization of the game is important. We want players to be able to run the game as smooth as possible with the highest FPS as possible. This patch is mainly focused on optimization as we have a "re-look" at current content and rework stuff where that's needed. Fixed some issues related to the recently added new terrain textures. Optimized a lot of gear textures. Optimized a lot of weapon textures. Optimized a lot of character clothes textures. Optimized the TPS (Third-Person) model of the "AK-12". Optimized the TPS (Third-Person) model of the "AMR2". Optimized the TPS (Third-Person) model of the "M200". It's important for us to explain exactly what we have done and what our plans are related to the changes mentioned above to avoid possible confusion. Our plan is to in the end rework every single custom gun in the game. With "custom gun" we mean for example: "AK-12", "M200", "AMR2" or any other gun / item that's been added by us to the game in a later state. We are mostly doing this because of optimization, but we are also not happy with the current state of most of the guns. By reworking them we will change their stats, the model, animations and textures. The reason why we are explaining this is because for the weapons listed above we have already finished their textures and models. After this patch those weapons (when dropping them on the ground) will already be using the new model and textures. Again, we will slowly rework the first-person models of those weapons too over time where then both the TPS and FPS model will be the same. For now, to optimize the game and fix major issues we have already replaced those TPS versions with the new model and textures. West Oaks is added back. Updated the "Static Truck Trailer" model. The back side of the trailer is now open allowing players to go inside. Fixed some item descriptions that could potentially cause the game to crash. Fixed a texture issue related to the "AK-M Elite". Updated the "Riot Shield Poland" item description. Updated the "Riot Shield 4RCD" item description. Updated the "IMI TAR-21 Halloween" item name. Updated / Reworked the "Personal Locker" store icon. Updated / Reworked the "GI-Access Locker" store icon. Updated / Reworked the "Personal Locker Hynx" store icon. Updated / Reworked the "Personal Locker E-Unit" store icon. Updated / Reworked the "Personal Locker Neon Dragon" store icon. Updated / Reworked the "Personal Locker Red Dragon" store icon. Updated / Reworked the "Personal Code Locker" store icon. Added a new clan Riot Shield called: "Riot Shield Ghost Squad". Added a new clan Riot Shield called: "Riot Shield NOYP". Added a new clan Riot Shield called: "Riot Shield CatZ". "STANAG-30" has been renamed to "STANAG Mag". "STANAG-45" has been renamed to "STANAG (45) Mag". "STANAG-60" has been renamed to "STANAG (60) Mag". "STANAG C-Mag" & "STANAG C-Mag Elite" keep the same names. "G36-30" has been renamed to "G36 Mag". "G36-40" has been renamed to "G36 (40) Mag". "G36-60" has been renamed to "G36 (60) Mag". "VSS-10" has been renamed to "VSS Mag". "VSS-20" has been renamed to "VSS (20) Mag". "MP7-30" has been renamed to "MP7 Mag". "MP7-40" has been renamed to "MP7 (40) Mag". "P226 Clip" has been renamed to "P226 Mag". ".338 AWM Clip" has been renamed to ".338 AW Magnum Mag". "P90 Clip" has been renamed to "P90 Mag". "Bizon Clip" has been renamed to "Bizon Mag". "SVD 10 Clip" has been renamed to "SVD Mag". "SVD 20 Clip" has been renamed to "SVD (20) Mag". "EVO-3 Clip" has been renamed to "EVO-3 Mag". "SMG-20" has been renamed to "SMG Mag". "SMG-40" has been renamed to "SMG (40) Mag". "G11 Ammo" has been renamed to "G11 Mag". ".50 BMG Clip" has been renamed to ".50 Cal-5 Mag". ".50 BMG 10 Clip" has been renamed to ".50 Cal-10 Mag". "Shotgun Shell 8x" has been renamed to "Shotgun Shells (8)". "Arrow Explosive" has been renamed to "Arrow (Explosive)". "Bundle Of Arrows" has been renamed to "Arrows". "Shotgun Shell 2x" has been renamed to "Shotgun Shells (2)". "Kruger .22 Mag" has been renamed to "Kruger .22 Pistol Mag". "Kruger Rifle 30" has been renamed to "Kruger Rifle (30) Mag". "Kruger Rifle 20" has been renamed to "Kruger Rifle (20) Mag". "Flare Gun Ammo" has been renamed to "Flare Cartridge". "1911 Clip" has been renamed to "1911 Mag". "ASVAL-30" has been renamed to "ASVAL Mag". "ASVAL-60" has been renamed to "ASVAL (60) Mag". "DMR Clip" has been renamed to "DMR Mag". "FN57 20 Clip" has been renamed to "FN57 (20) Mag". The "AKM" is now renamed to "AK-M". The "AK12" is now renamed to "AK-12". 7.62 Ammo (AK-47 Mag) has been completely removed from the game. All "AK" guns now use the same AK ammo. Therefor we have also renamed all "AK 5.45" ammo to "AK 7.62" ammo. With 7.62 (AK-47 Mag) Ammo being removed, everyone that had this ammo in their GI (Including inside guns) will have them changed to AK 7.62 (45) Mag's. (So no one will lose anything). "AK-M" now has on default AK 7.62 (45) Mag attached. "AK-47" now has on default AK 7.62 (45) Mag attached. All AK ammo now has the following format: AK 7.62 Mag, AK 7.62 (45) Mag, AK 7.62 Drum & AK 7.62 Drum Elite. This is from now on the ONLY AK ammo in the game. Hopefully everything is more clear now. If you have any questions just ask in the comments. The "AK-M" store icons are reworked to have the new magazine attached. Also skin recipes are updated. The "AK-47" store icons are reworked to have the new magazine attached. Also skin recipes are updated. Fixed some issues related to the new count-down system. The count-down would not always be 100% synced with the sound. Fixed a bug that caused zombies to still spawn before the radiation is released. Fixed a bug in the ending screen where rewards were not stacking properly. We would also like to point out that we are aware of the crashes currently happening in Battle Royale. We are still investigating the issues and for now we ask players to be patient and at the same time to ALWAYS upload the crash dump (when the menu pops up of course). This helps us very much fixing the issues. Also there's A LOT more to come for this game-mode and we're sorry that this patch doesn't contain hat much related to Battle Royale. Stuff that we aim to have finished for the next patch for Battle Royale is: Server optimization, a new map and the lobby / invite system so that players can play and queue up with their friends. Removed Cliffside from the available maps. No one was playing on the map and the only players that were pretty much on this map were using it to abuse the spawn system to reset their spawn. For now, we have disabled Cliffside and we will stick with Colorado only in survival. Fixed the "Code 6" error when creating a new character in Survival. Fixed an issue related to the crafting menu key bind. Players should now be able to bind a button to open the crafting menu in-game like the inventory. The pill case has been fixed / reworked. (Also new icon) There was some major issues related to this item so we were forced to rework it. This has been done and that means it can finally be released! (Pill cases are needed to craft high-end) medical items. Added a new crafting item called "Code Lock". For now this item is only useful to create lockers with, we plan later on to make it useful for other stuff too. To craft a "Code Lock" you'll need 1 tech and 10 metal. Added a new crafting item called "Metal Gear". This item can be found and used to craft for example a locker. Added / Released lockers. The new "Small Code Locker" is now available and craft-able in survival. To craft a "Small Code Locker" you'll need 50 metal, 1 Code Lock and 1 Metal Gear. Now that the pill case has been fixed / reworked it's spawning again. Now that the pills have been fixed / reworked it's spawning again. Increased the spawn rates of vaccines. Metal gears are now added to the loot tables. Metal gears are rare because we don't want players to instantly have 100's of lockers. Lockers will be a high-valued item and something a player has to farm / work for. Metal gears are also added to the airdrop loot meaning your best chance to get a metal gear is to loot random airdrops. Fixed / Added a car spawn in Mountain Crest. For some reason there was no car spawn here. This has been fixed. Fixed some flying rocks around the map. Fixed some general issues related to the car spawns. Fixed some objects that were placed inside the ground in Rifle Ridge. Fixed an extremely annoying ambient sound issue in the "5 story" in Campos City. Blocked the access on top of a building in Campos City that was abused by players. Players can no longer get up here. Due to community feedback we have rotated the white house in Mountain Crest 180* degrees. This house in general is way too open and hard for players to push when other players are camping inside. By rotating the building the stair will be at the other side of the building making it harder for campers to get the right angles when players push this building. We will keep investigating how this change goes and if needed improve even further. A lot of work is still being done for Survival as we are working on the new map. Stay tuned for more updates and features coming very soon! "Event Skins" are now hard-coded available on only this map. Event skins are a blue / red version of the heavy armor, k style and custom guerrilla. Only in the event map these skins are available. This has been added so players can easier separate teams during events. Random spawns have been force-enabled on the map so that when players are joining back they will always spawn in the safe zone. This is done to prevent players from "abusing" the spawn system and ghost back in the map in certain places. The use of bus stops in the event map are now 100% free. This allows players to move to a certain event area faster without having to walk a long distance. Added a new spectator zone on top of the fire station using a small layer of collision walls (Invisible Walls). We used invisible "walls" to prevent streamers from making footsteps while being up there. Added a new bus stop in the stronghold area. Fixed some flying rocks around Ridgeway Airport. Fixed / Optimized shadows. Also fixed some glitches related to shadows showing at certain periods of a day. Lowered the overall render settings distance to increase FPS and performance. Fixed a collision wall (invisible wall) problem at Cottonwood Outpost. Fixed some no-clippable trees at Rotten Valley. Fixed some flying objects at Norad Military Base. Fixed a player spawn at Death Valley that was outside of the map. Fixed a building in Boulder City where players would be able to look through certain windows only from the inside to the outside. Updated the collision walls around the Nato base. This should also increase performance. Removed the old secret spot and added a new one. Removed some mis-placed street lights in the Downtown (center) part of the city. Fixed some miss-placed street lights overall in the whole map. Added an invisible wall in a "known" camp spot where one of the buildings had a small room where players often camp. We are now preventing players from going in there until we've reworked the building. Reworked / Repainted the terrain and hills around the map. Added overall more objects for players to have more cover. Fixed a no-clippable couch in the "red house 3" in Clearview. Fixed some flying objects around the plane crash site. Fixed a problem related to the fence around the "little white house" in Clearview. Fixed / Improved some collision walls (invisible walls) behind the "mossy" building in Clearview. Fixed some dumpsters that were placed inside the ground. Fixed / Improved some terrain settings and textures. This should increase FPS and performance. Lowered the walls around the "military area". Players should be able to jump over the walls now without any problems. We would like to point out once again that a lot of points on these patch notes (mostly related to optimization) are not directly visibly noticeable from the player's perspective. We have done a lot of work and major improvements making the game more stable and optimized while at the same time from the player's perspective visually nothing much changed. At the same time we want to know who notices any improvements. Let us know in the comments! Estimated patch size: 400 mb. HYPE HYPE HYPE HYPE HYPE HYPE HYPE HYPE!!!!!!!!!!!!!!!!!!!!!!!!!!!!!!!!!!!!!!!!!!!!!!!!!!!!!!!!!!!!!!!!!!!!!!!!!!!!!!!!!!!!!! Are you planning to put Harvesting tool to farm craft in survival instead of looting it? True. Just give us a chance to correct ourselves. I've never been on that building you're talking about but I know which one youre talking about. Looks like this "fix" was made by butthurt bambi civilians admins trying to kill some assassins but hwo failed at it. I know because i was there watching the whole scene. Meanwhile the small invisible backpack still hasn't been fixed since the beginning. You should really implement back ak-12 (so it could be found ingame). Not sure why it became legacy in first place... AK 47 should be legacy item, but it's your game you choose. What do you mean with "Meanwhile the small invisible backpack still hasn't been fixed since the beginning."? This is an awesome patch. Thanks to all who worked hard fixing these issues. However, this still doesn't explain why there were no witch hats or battle axes anywhere, and everywhere I searched. Believe me, I searched extensively for these items. Keep up the great work. The game as a whole is coming along nicely and I, for one, very much appreciate the work that goes into running a world-wide gaming server. To you and yours... Have a Nice Day!!! What's the "problem" with the small invisible backpack?